On the digital turn in scholarship: methodology, sources, policy and organisations. Particular themes are web archives and web history, research data, and changes in scholarly communication. 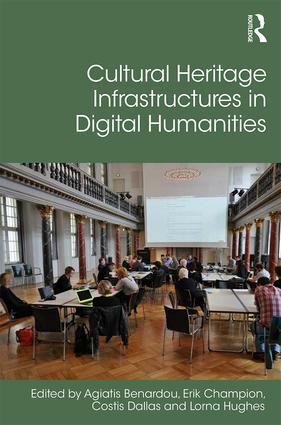 Cultural Heritage Infrastructures in Digital Humanities. Agiatis Benardou, Erik Champion, Costis Dallas and Lorna M. Hughes (eds). Routledge, 2017. The digital turn in humanities research over the last three decades has enabled the asking of new research questions: the availability of fresh tools and techniques, as well as digitised objects to which to apply them, has opened up angles of enquiry on almost any subject. This was already deeply felt in the pioneering humanities computing projects of the 1980s, but the pervasiveness of the internet has prompted thinking at national and international levels, particularly in the 2000s, about how those new kinds of research might best be enabled in a networked, geographically dispersed context. At the same time, the policy environment for humanities research has been inflected by external forces: the energy directed towards ‘cyber-infrastructure’ for the ‘hard’ sciences; the increasing pressure on the custodians of cultural heritage (publicly funded galleries, libraries, archives and museums (the GLAM sector) in particular) to maximise the use of their holdings. Also, in Europe especially, there has been an emphasis on a common heritage of European civilisation that ought to be studied comparatively as part of a more general projection of the European ideal. As a result, the European Union has funded, and continues to fund, ‘research infrastructures’ for the humanities in varying shapes and sizes, although it is not alone in doing so. However, as the editors of Cultural Heritage Infrastructures in Digital Humanities point out, there is as yet little reflection available on the impact these research infrastructures have had both on the academy and the wider public (5). This collection of essays is a very valuable contribution to that process of assessment, and deserves to be widely read. It will be of interest not only to humanities scholars, but also to those in the GLAM sector concerned with user engagement and access, as well as policymakers in and around government. The eleven chapters presented fall into several kinds. Readers most specifically concerned with the broad strategic issues concerning infrastructure provision – i.e. which services these infrastructures should provide, to whom and using which technologies – will be best served by contributions from Seamus Ross; Veerle Vanden Daelen on the European Holocaust Research Infrastructure (EHRI); Agiatis Benardou and Alastair Dunning on Europeana; Sharon Webb and Aileen O’Carroll on digital tools in Ireland, and; Tobias Blanke, Conny Kristel and Laurent Romary’s chapter, and the editorial introduction. Other contributions focus not so much on these wider issues as on individual disciplines or on particular tools and services. Although edited by scholars from Australia, Canada, Greece and the UK, the focus of the collection is weighted towards Europe; while the collection is none the worse for that, there is still room for reflection on the situation in other contexts. Some common themes stand out. The collection is shot through with a refreshing awareness of how crucial engagement with the user is in creating a service that meets their needs. This is welcome indeed, since there is no shortage of digital services that serve their users less well than they might, largely because those commissioning, designing and building them did not stop to ask what users required. The well-documented example of Project Bamboo in the United States disappointed the hopes placed on it largely for this reason, and is acknowledged here. This reviewer was also reminded once again of the sheer particularity of humanities scholarship both in terms of method and the kinds of materials in use, which points up the difficulty of creating infrastructures that suit more than a small number of scholars. A juxtaposition of Gertraud Koch’s essay on anthropology and that of Christina Kamposiori, Claire Warwick and Simon Mahony on art history serves to make the point: different humanities disciplines often make use of very different kinds of digital objects, and where they do use the same materials, quite distinct working assumptions are made about them. Furthermore, disciplines are also marked by varying levels of digital skills amongst their practitioners. Given all this, the challenges in designing services that meet all these needs are formidable. The experience of EHRI – providing a service that allowed scholars to discover materials in many archives relating to the Holocaust – shows the difficulty of creating such a service even for what, on the face of it, is a relatively clearly defined class of resources. Despite all the stimulating and useful material this collection provides, a question mark remains over whether persistent organisational and technical structures are the best way of fostering research in the digital humanities. The question is met head on by Blanke, Kristel and Romary, who rightly acknowledge the complexity of creating large semi-permanent distributed digital services to connect very diverse individual tools and resources, especially as both the needs of users and the technologies available change rapidly and asymmetrically with each other. Beyond this book, however, the wider debate about how to enable distributed humanities scholarship is still often framed in terms of the shape that such infrastructures should take; their desirability in principle is not often stated as such, but is assumed. Andrew Prescott has rightly taken issue with the whole metaphor of infrastructure as an unhelpful way of imagining what is required. To envisage things in terms of infrastructure implies permanence, rigidity, standardisation. An alternative case might be made for the metaphor of the ecosystem, with which Blanke and colleagues also make play. One can imagine a scholarly ecosystem in which individual libraries and archives concentrate on understanding their own users and designing services to meet their specific needs, whilst exposing data in a maximally open but passive way for others to access as and when they need to. Some of the funding currently directed at intermediate technical structures might instead be used to develop this local capacity. At the same time, funders might also invest in three other things: observing and reporting on the directions in which research in each community is heading (in the manner of the now defunct AHRC Digital Methods Network and other projects, as noted on pages 4-5); developing the individual technical skills of researchers in exploiting those resources and in making their own tools; and supporting the development of many community-specific tools and projects in response to demand, on the condition that those same tools are openly available for reuse and adaptation as needs change. To be sure, several of the existing infrastructures do some or all of these things, but it may be that that is all they should do. This is not necessarily to advocate such a way of working, but merely to pose the question of whether the infrastructural paradigm is necessarily the only way available. This reviewer, at least, remains to be convinced that the demand for infrastructures that federate access and analysis has been shown to be present amongst end users. But while Webb and O’Carroll rightly suggest that the idea that ‘if you build it, they will come’ (129) has had its day amongst those who create individual tools and services, is it not alive and well at the infrastructural level? As a minimum, we ought to ask whether the dominance of the infrastructual paradigm is not due to its appeal to large providers of content and its comparative simplicity to fund and administer, rather than its intrinsic rightness as a way of fostering research. Readers will differ on the answers to this question, but anyone concerned with the future of digital humanities research will find much to ponder in this timely and important collection of essays.